Look no further as you have found your new home away from home and prepare for an unforgettable vacation. 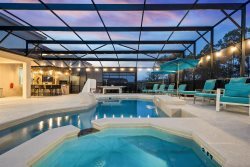 This beautiful 5 bedroom 4.5 bath pool home is perfect for making this the base for your Orlando vacation A large formal living, and dining area with seating for 8, greets you. The home has two living areas a formal, and a family room, giving your group a great choice of places to relax and unwind. Each has large flat screen TV's, with plenty of plush seating. The kitchen has stainless steel appliances with granite countertops allows for easy meals to be made for the family. There is also a breakfast bar for additional seating. A set of glass doors will lead you out to your private screened in pool area. Take a dip in the sparking blue waters, or melt the stress away in the spill over spa, There is a covered lanai with ample outside seating, sun loungers are provided allowing you to lay out and catch all the warm Florida rays. As a piece of mind, the villa also has a pool fence perfect for the little ones. The bedding arrangements make this villa perfect for groups or families looking to share. There is a ground floor king size bedroom with ensuite great for grandparents. The second floor has a king, and a queen size master bedroom both with en-suite baths, and flat screen TVs'. You will also find the bunk beds bedroom that will share a Jack n Jill bathroom with a room with two twin size beds. This home is the ideal vacation destination for your family to stay and enjoy. All the comforts of home in more. Don't waste time and book this beautiful home with us today!